The Kardashian crypt keeper, Bruce Jenner, was on Late Night With Jimmy Fallon a couple of nights ago. The two apparently have some sort of ‘feud’ going on, where Jimmy consistently used to make fun of Bruce’s frozen face and Bruce, for some weird reason, felt insulted. Don’t you need to feel emotion to be insulted? So of course, Jimmy invited Bruce onto his show to sort out any differences. The first thing Bruce brings up is his plastic surgery. He says, “I’m not trying to hide anything, I had it done on camera, on our show. It’s not like I’m trying to hide anything. But you guys go out there, and what you guys wind up doing is taking the absolute worse picture of me… to prove the point, I get it. And then you make your jokes.” He also talks about Jimmy making fun of his daughters for wearing bad clothes, and then tries turning the table on Jimmy Fallon by bringing bad pictures of him. Nice one, Bruce. Of course, the delusion hasn’t left him completely. He talks about the numbers for their most recent episode of ‘Keeping Up With the Kardashians’ being ‘through the roof’, and says, “I’m a Kardashian. We’re invincible, we can take anything.” And this is where it gets good. He adds, “But Kanye [West] is really pissed. My good friend Kanye is pissed. And you don’t want to go there.” I assume he’s referring to Jimmy making fun of Kim [Kardashian] and her bad taste in maternity clothing, since I don’t see how Kanye West would care about Bruce Jenner’s plastic face. Jimmy looks confused, so Bruce adds, with a completely deadpan face, “He’s family. We love Kanye.” Is he making a joke? It’s kind of hard to tell, with that face. Overall, I actually came away with a greater appreciation for Bruce. He definitely still looks like the crypt keeper, but he’s got a surprisingly funny sense of humor. Things we learned: Kanye West is ‘pissed’ about something [when isn’t he?]. Bruce Jenner either loves or hates Kanye. 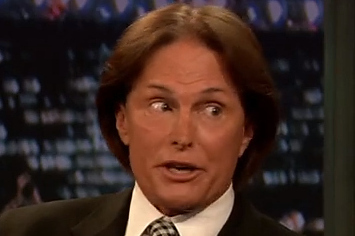 And Bruce can be funny if he manages to escape out from Kris Jenner’s thumb.